Great Stella(and Stella4D) can create various compounds of polyhedra. A compound is two or more polyhedra intersecting in interesting ways. Depending on the compound, these can be made via stellation, faceting, augmentation, or a combination of methods. But you don't have to figure out how, as a great many compounds are included in the polyhedron library and ready to go. Click on the images below to see a bigger picture and get more information about how they were built. A nice compound can often be made by combining a polyhedron with its dual. These are easily made in Great Stellaand Stella4D. Notice that a vertex of either shape sits above a face of the other, and for uniform polyhedra, an edge of one will intersect an edge of the other at right angles. If regular, these edges will also bisect each other. The most common compounds of interest are ones where the polyhedra involved are all the same, and each fit into the whole in the same way. See if you can recognise what polyhedra is making up each compound below before clicking on them to see if you're right. Here's an interesting subset of symmetric compounds, each consisting of 15 cuboids. These are kind of a generalisation of the well known compound of 5 cubes, where each is split into three cuboids (see final paper model below). A different compound of 15 cuboids can be created based on any seed point placed within icosahedral symmetry. The ones below were all created as facetings of various Archimedean solids. 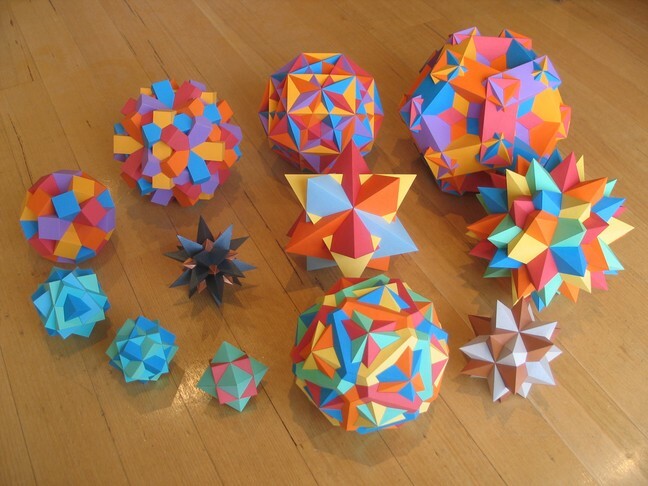 These and more examples can be found in Stella's polyhedron library. And why not just put miscellaneous polyhedra together in a compound?